Well I finally got my photos from my cross country trip processed and as always the B&O Main Line section was the last to get done. While the info is a few months old now I still wanted to provide some updates on what has changes along the route since my last trip in 2012. We begin at GREENE JCT in Connellsville, PA which represented the last island of B&O CPL signaling on the Keystone Sub. 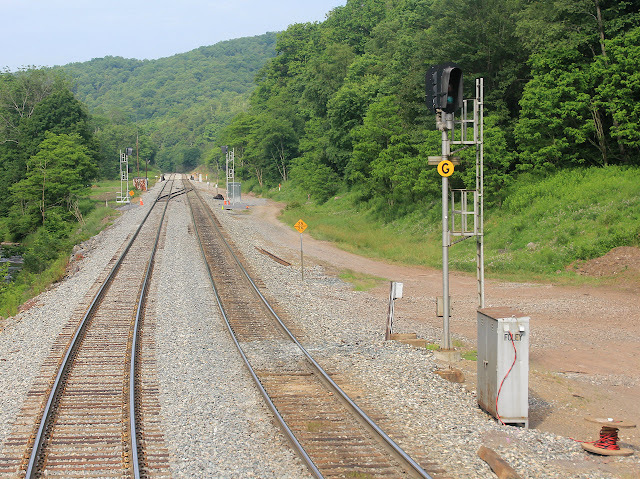 Well it seems that CSX noticed as well as when I passed back in June the new signals were up an were cut over just a month or so later. At the west end of the interlocking the CPL bracket is being replaced by a two track cantilever and the yard dwarfs are being replaced by a 6 track, 4 signal signal bridge. Not why why CSX really thought such an extravagance was necessary, but oh well. Two of the 2 signals allow for Medium Speed movements. On the east end the single CPL past and remaining dwarfs are being replaced by a 3-signal, 4-track gantry. All intermediate signals are being removed. Guess with microprocessor controlled logic there's no need for such logic saving tricks. The new signals were placed in service a month or two later around August 2013. I found some evidence that the decaying CPL mast off the branch line was upgraded with a brand new CPL mast before being Darthed. Heartbreaking. 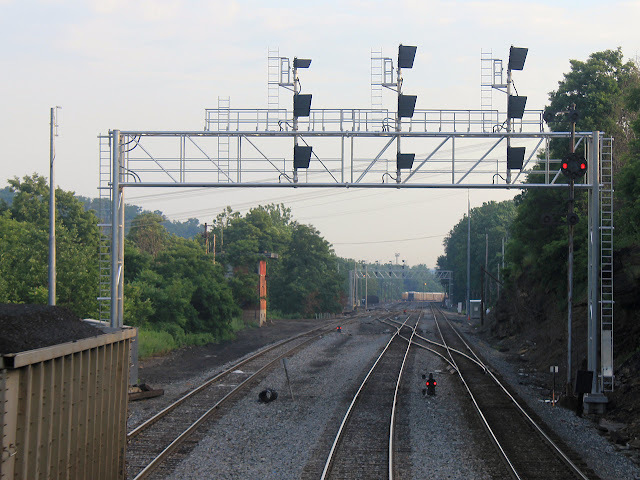 The BLUE STONE CPL bracket holdout signal is also being replaced by a new signaling location named CASPARIS visible in the background. Looks like the last remaining stump of the original B&O pole line will be retained if the new transformer is any indication. UPDATE: 2014 view of new CASPARIS interlocking. Not sure what will happen to the old CASPARIS location which is a spring switch at the end of the third siding track. There appears to be no work going on her so perhaps the siding is going to be shortened to avoid trains needing to sight signals around a curve. 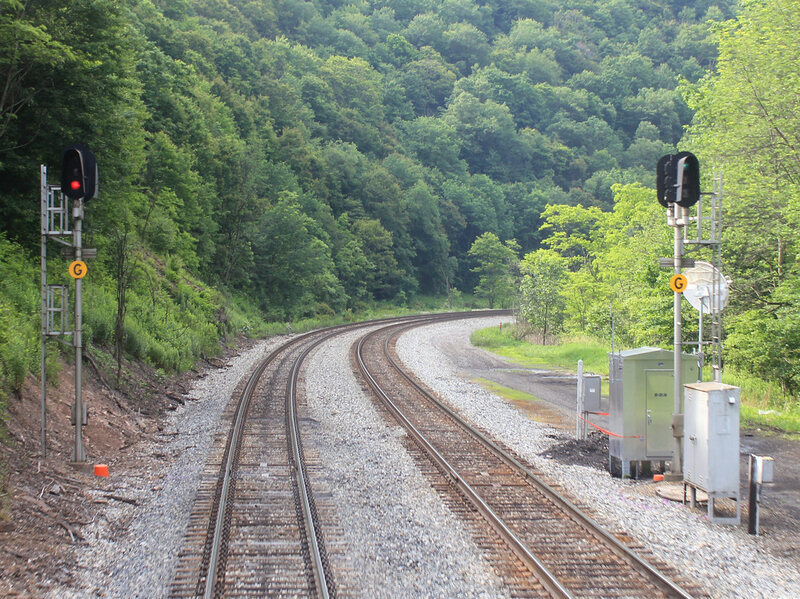 A new interlocking, FORT HILL, has replaced the old SHOO FLY interlocking at the west end of the signal track segment through the Shoo Fly and Pinkerton tunnels. This extends the length of the single track, but the daylighting project might convert it into a crossover once the second track is put back in. PINKERTON interlocking at the east end was left untouched. The original B&O Main Line Darth Vader project between Viaduct Junction and Sand Patch is being re-resignaled. 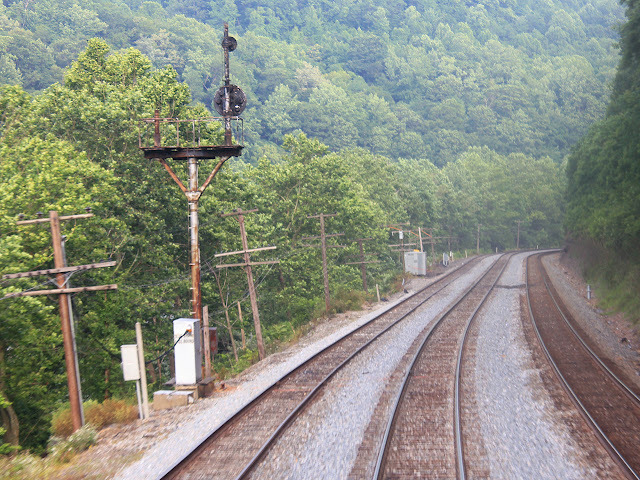 Because the section of track was original CTC/TCS territory CSX didn't bother to replace the logic/relay cabinets. Well that oversight has since been rectified as seen here at NA Tower. In some cases the signals themselves are being replaced as seen here at FO Tower with a pair of former CPL's located on a curve. Well due to some hosting issues with my mirror site all those semaphore photos I posted are now down so I might as well cover up the problem with a new post. 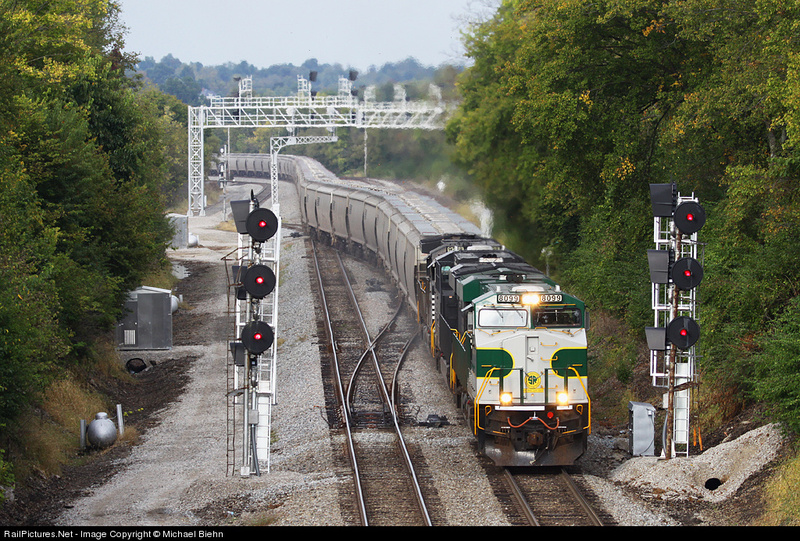 I'll start off with the ongoing re-signaling of the NS line in Kentucky and Tennessee which used Southern style signaling with a searchlight flare. All going the way of Darth Vader masts of course. In a potentially HUGE loss NS is resignaling WORTHINGTON interlocking in Worthington, OH where the former N&W main crossed the PRR main at a very shallow angle. This resulted in the continued use of A-5 pneumatic point machines for the movable point diamonds (something that requires 2 M3 machines). 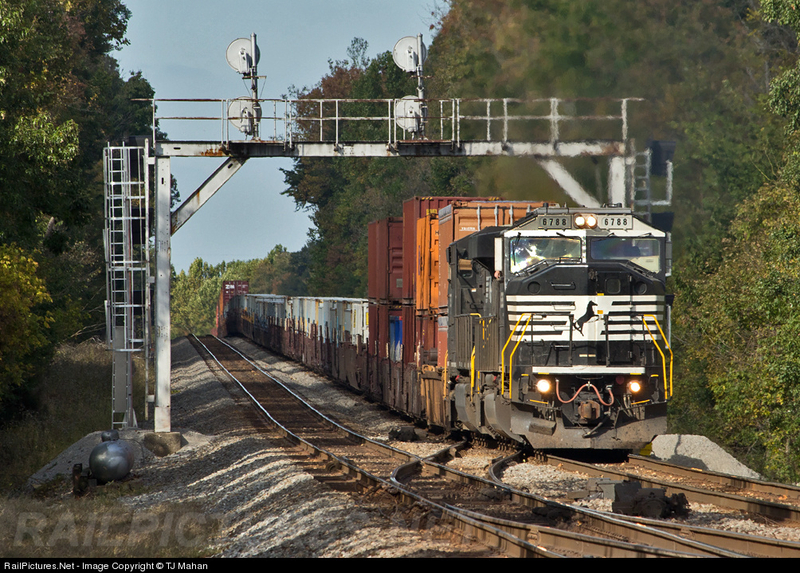 Will NS keep the air plant even after dumping the N&O CPLs? Remains to be seen. CN is resignaling someone in Ontario, but unlike NS they are actually bothering to keep their early-modern cantilever mast. 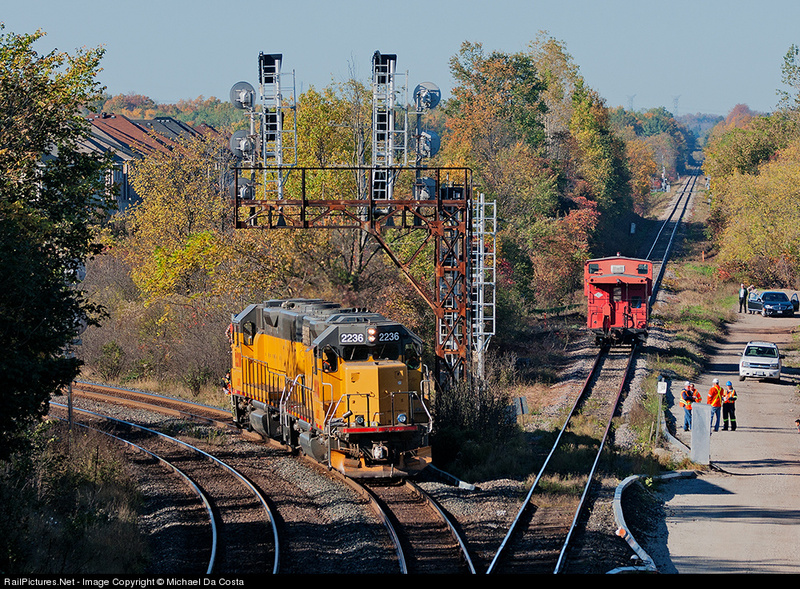 This is a frequent practice for CN, having also kept classic signal bridges on the 4-track line west of Toronto. 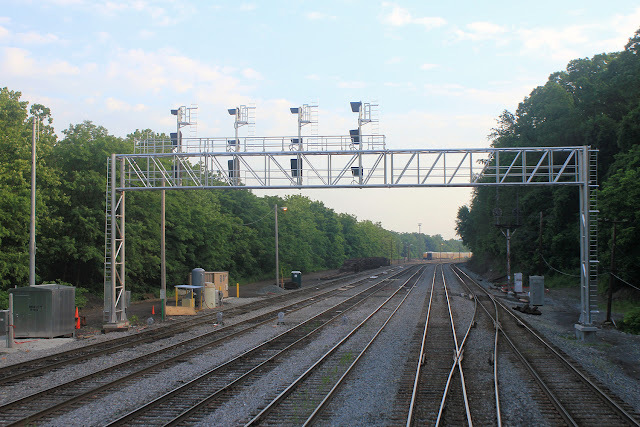 Finally in a bit of Good news New Jersey Transit recently finished the Pennshawken Transportation Center project which included three new interlockings in the Delair Bridge area including a new interlocking at the old JORDAN block station which was always a non-interlocked junction. Of course all of these come with the increasingly rare round target type signal. Here is a picture showing the restored DIVIDE interlocking (formerly remote JERSEY) with 6-unit dwarf stacks awaiting replacement by a 3-track signal bridge. 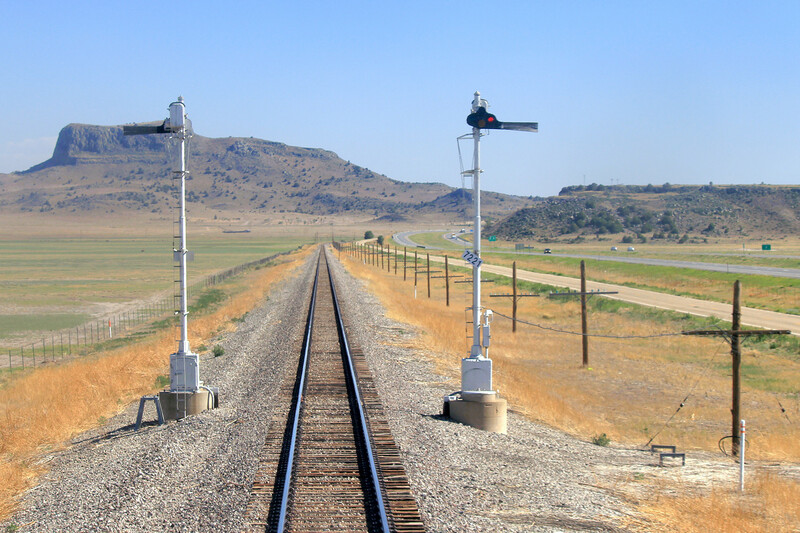 In the year 2000 active Semaphore signals in North America were rare, but everybody new where to find them. There were a few on the Southern Tier Line in NY State and of course the old Monon main line in Indiana and the CNW Station and Brighton Bark in Chicago. Out west there were some in Montana, Oregon and of course New Mexico on the former ATSF Raton Pass line. 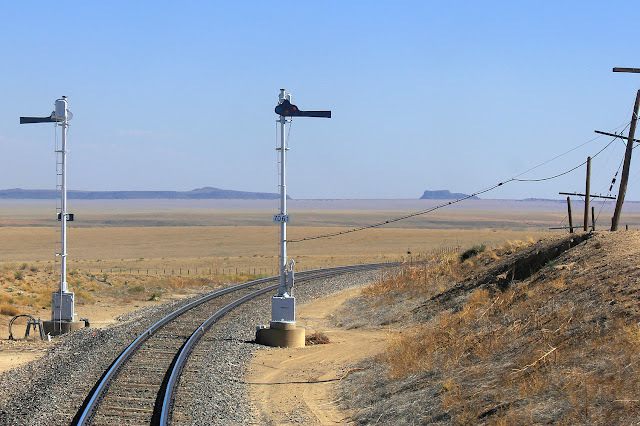 There was even a website you could go to, www.semaphores.com, that kept track of all the surviving semaphore signals so you could go find the one nearest you. 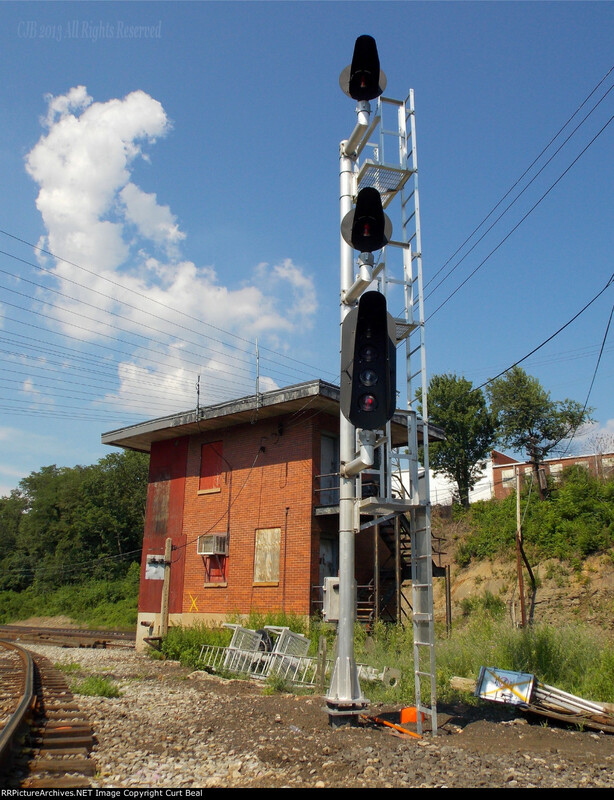 Well, the 19th century economics were electricity was more valuable than human labor could no longer be ignored and the old semaphores kept falling with the Oregon Southern dumping then in 2002, Brighton Park in 2007, the Monon semaphores finally in 2010. While I do believe there may be a few other active semaphores scattered around in parts of the west, and of course the plethora of fixed distants, the last stand of Semaphore signaling is taking place on the former ATSF Raton Pass Line. 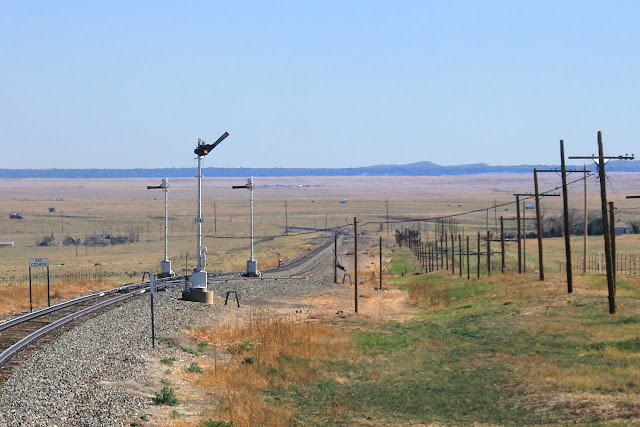 Unfortunately the reason is not some strange 1980's Semaphore rehabilitation project, but the simple fact that BNSF is trying to abandon the route and are unlikely to spend any money to upgrade the signaling. 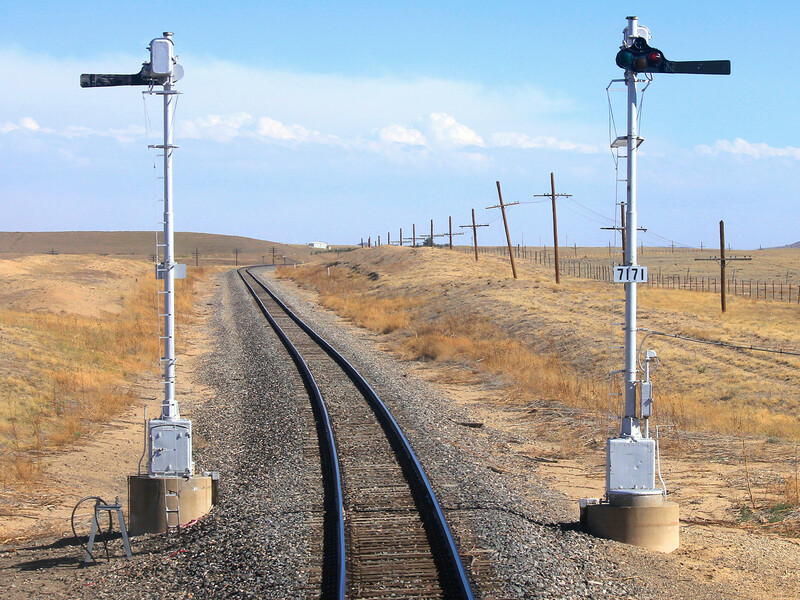 In fact BNSF had been replacing the semaphores at a fairly even clip when they just halted the project leaving a few new signal bases in want of a signal. So like Z Tower in Keyser this is one of those situations that is only better before it gets catastrophically worse. 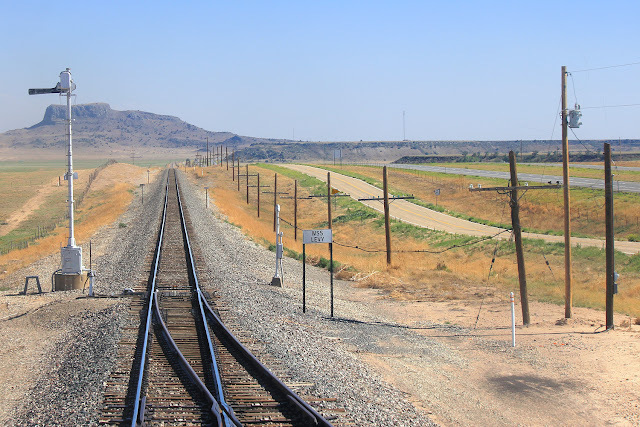 The photos I will present here are from the June 2013 trip on Amtrak's Train #4, the Southwest Chief. 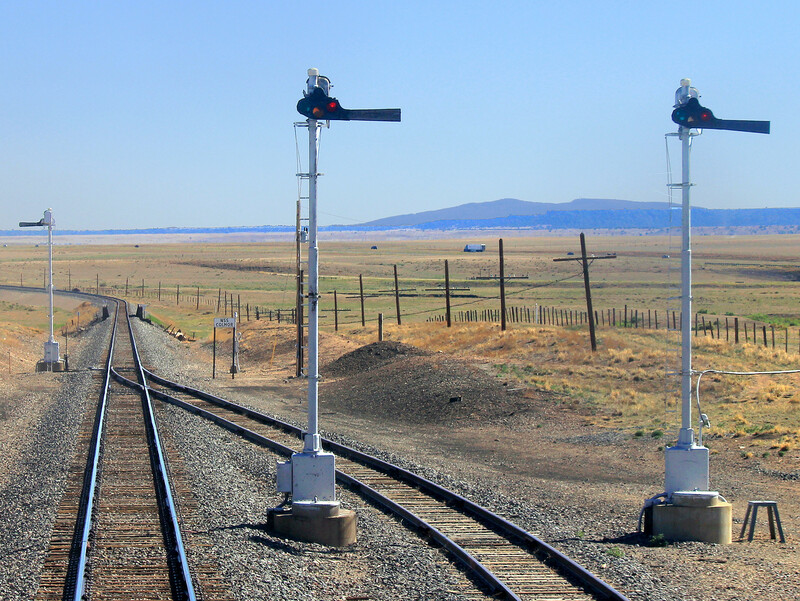 They were taking in the eastbound direction facing west, but I will be slowing them off in ascending Milepost order which is in the westbound direction. 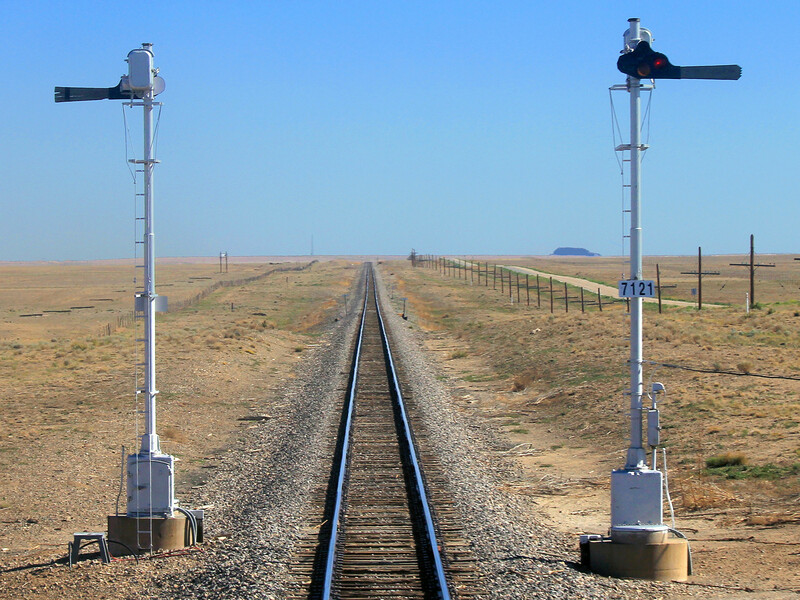 A second set of photos of the signaling on this route is available from RedOverYellow.com and shows the same signals taken from train #3 in the eastbound facing direction can be found here in the sections 1001-1079 La Junta and 1080-1169 Lamy. You can find my complete sets of photos covering the Semaphore section of the Southwest Chief route here and here. Also many of the photos are at higher than normal resolution so remember to click the small form factor photos to see the whole thing. 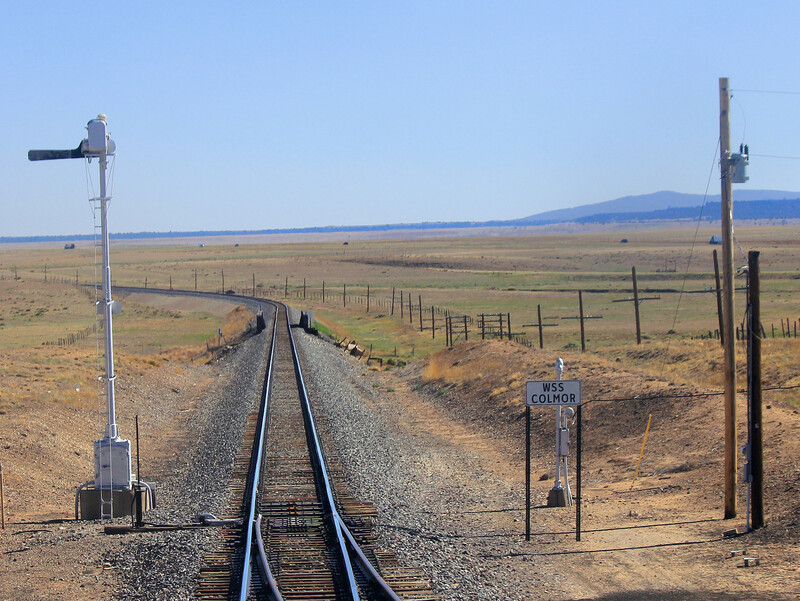 We begin at the MP 706 automatic signal on the plain west of Springer, NM. 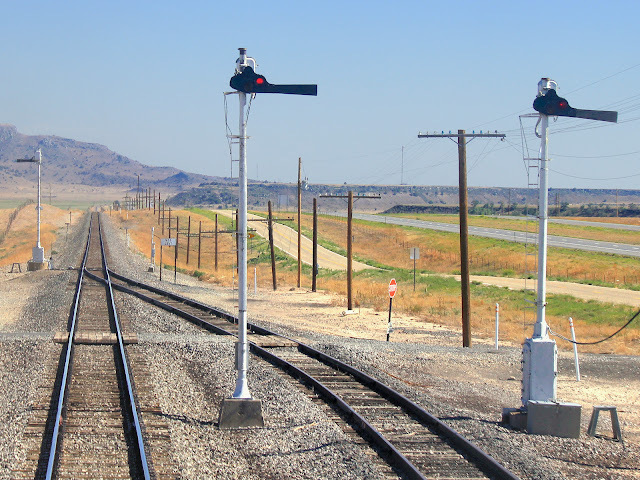 The signals on this route don't just represent the last of their specific type of signal, but also are showcases of several old style technologies such as pole-line communications, battery power supplies and bi-directional single track ABS signaling with signaled passing sidings. Note the new base for a replacement color light signal that was never installed when all capitol upgrade work was halted sever years ago. Closeup of the MP 706 automatic. All the semaphores on this route are US&S Style T-2's with pole mounted motors and relays stored in the case at the base of the mast. Another interesting feature is the use of roud battery wells that are built into the concrete signal footing. 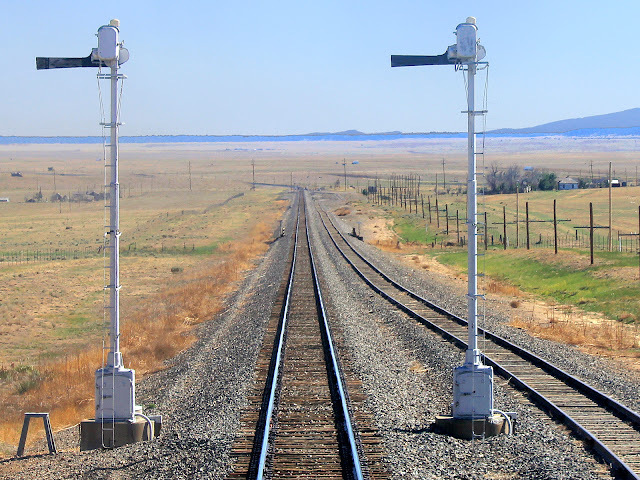 Semaphores at the east end of the Colmor siding at MP 709. The blade automatically clears to an Approach position for the signals at the west end of the siding that remain at stop. 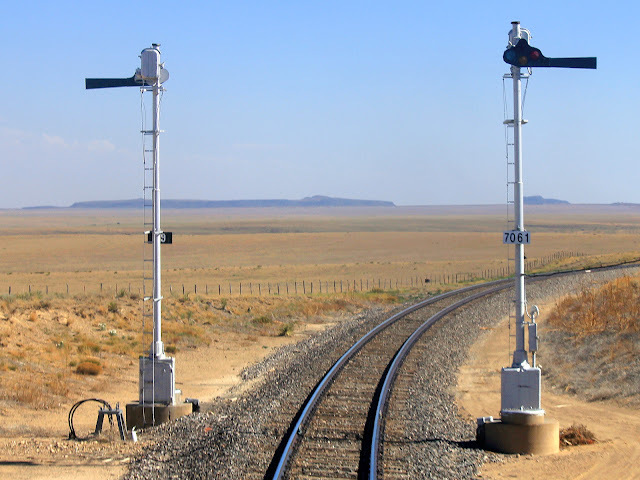 Despite being automatic, the signals do not always behave as one would expect from a system with no traffic control at all. I suspect there is logic at these sidings that will only attempt to clear an exit signal for an approaching train. Eastbound signals at the east end of the Colmor siding. Note the replacement base that was installed before the upgrade was called off. West end of the Colmor siding. Without number plates these signals are absolute, although this is not CTC territory and the signals operate automatically. Note the sun coming through the spectacles and the blades which are no longer painted and have been left to weather into a uniform gray color. Eastbound signal at West Colmor. 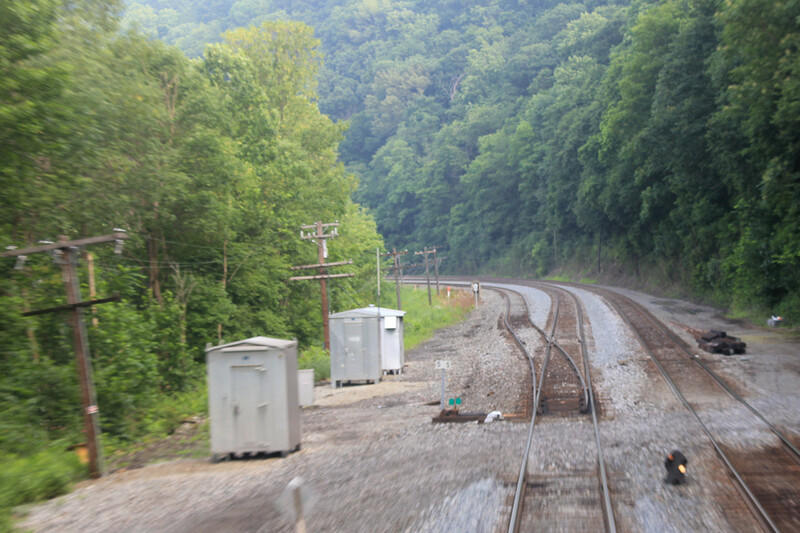 Note the use of spring switches to facilitate trains waiting in the siding getting moving again. MP 712 automatics in the middle of a flat grassland. MP 717 automatics. Note the riveted fabrication of both the T-2 semaphore unit and the relay cases. The often photographed semaphore signals at West levy. 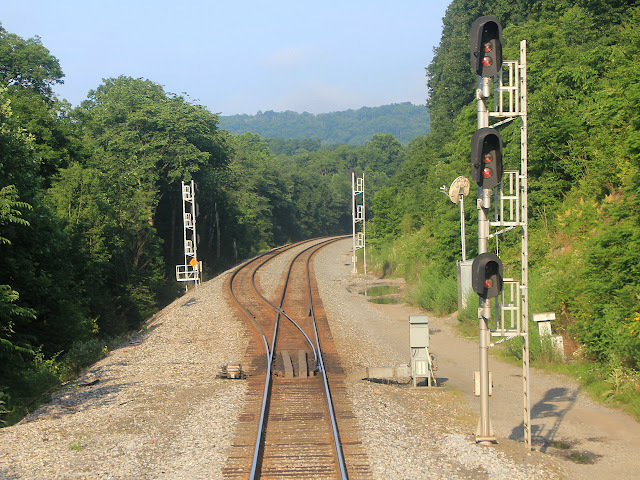 These are for westbound movements off the siding. The east end of the siding has new color lights installed on the onmipresent bases before the boom lowered. Eastbound signal and spring switch at West Levy. At sidings the signals protecting the siding entrance are automatic. MP 721 automatics with a mesa in the background and Interstate 25 off to the right. In the heyday of North American railroad signaling railroads and transit systems alike were in either the US&S Camp or the GRS Camp, although a brave few sometimes split their orders. Well it turns out that the abandoned Springfield Subway system was in the former as evidenced by this screen capture from the 14th episode of the 21st season of The Simpsons entitled Postcards from the Wedge. In this episode Bart commandeers a train in the disused Springfield Subway and Homer manages to save him by running into the subway control room and pulling a large and conveniently labeled "Kill Switch." Well, what else appears in the background but an animated US&S Model 14 interlocking machine!! I'm serious, check it out. Of all the nit picky technical things I would have picked for The Simpsons to get RIGHT in an episode this probably would have been near the bottom of my list. The mechanics of how this happens is not completely hard to guess at however, The subway system in New York, a well known source of comedic writing and animation talent, has a number of "fishbowl towers" on the IND division where old interlocking machines such as the Model 14 shown are visible to anyone standing around on the platform. The most access able of the Model 14 towers are in Queens, like this example at Union Turnpike, although I have been told one can see into Jay St in Brooklyn as well.